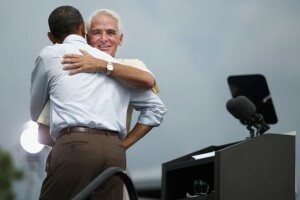 Is The President Obama/Charlie Crist Bromance Fading? We all remember the hug seen around the world. Republicans talked about it incessantly. Now Charlie Crist can’t stop talking about it, especially wherever there are African-American voters. President Barack Obama has become Charlie’s “go-to” topic when he can’t answer a question of any substance. Once a critic of the Affordable Care Act and President Obama, Charlie Crist has become his biggest cheerleader when trying to get Democratic votes. The man who went on record saying Sarah Palin was a more effective leader than President Obama is now singing the President’s praises for votes, but is that Obama connection fading? Obama folks are very upset that the “campaign is a train wreck. Charlie won’t listen, he is lazy and won’t work. He only wants to show up for fundraisers and events with media. His father and wife are running the campaign and he refuses to listen to a team with a proven track record (Obama’s team). At the National Action Network Forum, Crist DID say his wife told him what to get up there and say. I think his exact words were that she told him to “call a thing a thing”. Yeah, I could see how that would concern the Obama folks. Crist, once ahead of Rick Scott by double digits in the polls, is now behind Scott. The millions of dollars spent by Scott’s campaign has something to do with it, but could it be that Crist has come to a nuclear fight equipped with only bayonets? Crist recently went on The Ed Schultz show and referenced “right to choose” about his wife’s tax returns. Given the Hobby Lobby ruling that was just handed down from The Supreme Court, likening a woman’s body, and the fight we still have to wage after all this time, to his wife’s tax returns is just plain old stupid. I know, I know, a lot of Democrats want to give Crist a pass on just about anything he has done, is doing, and will do, simply to get rid of Rick Scott, but this war on women is not something to be taken so lightly. I hope that was just another Crist faux pas, and he really doesn’t think our bodies are equal to his wife’s tax returns. But who knows what Crist really thinks. He won’t get on a stage and debate Nan Rich. Smoke and mirrors only work on the uneducated. An educated voter is Nan’s best chance. Women are wise. Wise women vote. Lots of wise women in Florida. Wise women exercise this privilege. Wise . women mail in their absentee ballots. Wise women also pick up elderly wise women on voting day. Heard they want a wise woman as Governor. Nan is quite wise.This primary can be one of those very wise Tuesdays.